Jonathan Brilliant was born in 1976 in Charleston, South Carolina. Brilliant holds a B.A. in studio art from the College of Charleston and an M.F.A. in Spatial Arts from San Jose State University. Brilliant is a recipient of an individual artist grant from the Pollock Krasner Foundation and is a South Carolina Arts Commission Visual Arts Fellow. 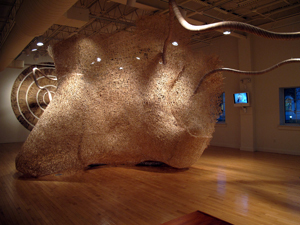 He has exhibited his work in several group and solo exhibitions nationally and internationally. He has received numerous fellowships to artist residencies and communities including: McColl Center for Visual Art, The Ox-Bow school of Art, The Vermont Studio Center, Redux Contemporary Art Center, and The East/West Project in Berlin Germany. He has served as a visiting artist for The University of Oklahoma, Kendall College of Art and Design, University of Memphis, Coastal Carolina University, and Winthrop University among others. From May 2009-December 2010 he conducted his “Have Sticks Will Travel world Tour”. The tour was a marathon series of site-specific installations that took place in thirteen galleries in eighteen months, in three countries, on two continents and included a stop at the Bumbershoot Festival in Seattle WA. In 2011 he was the Artist in Residence at the Visual Arts Center of Richmond where he created a comprehensive multi-room installation utilizing coffee shop ephemera. In 2012 he will be on the road again creating both temporary and permanent works for a variety of venues. To learn more, please visit www.jonathanbrilliant.com. Soup to Nuts is an American English idiom conveying the meaning of “from beginning to end.” The phrase comes from the description of a full course dinner, in which courses progress from a soup to a dessert of nuts. These dinners are intimate casual affairs with artists serving as the main course. Of course we don’t eat the artist! Rather, we eat soup and devour the featured artist’s creative process as they describe inspiration, passions, grunt work, and, ultimately, final result. Lively conversation ensues. Soup to Nuts. These events occur 4 times per year and are a benefit of Patron Membership.